The snow storm of a couple days ago presented what I figured would be one of the last opportunities for good snowshoeing within a 35-mile radius of Fort Collins. 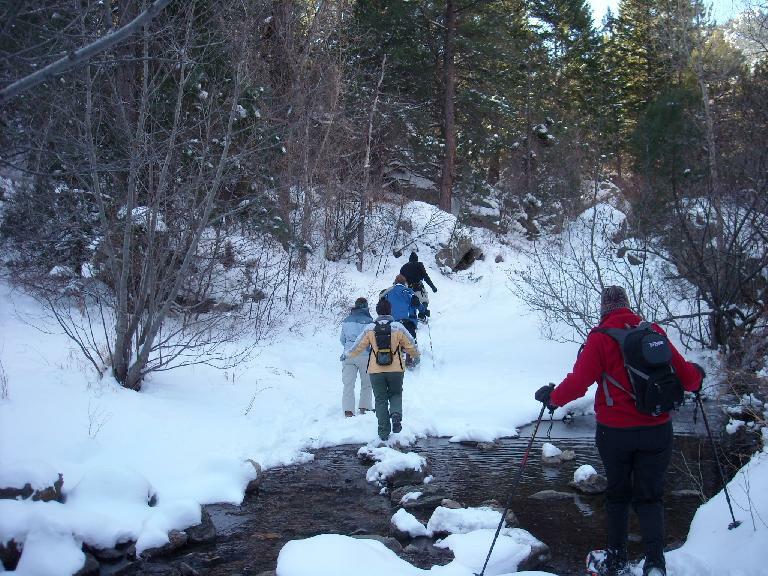 I couldn’t resist, then, joining up with a local outdoors group on a short snowshoe hike at Young Gulch, a trail located in the Poudre Canyon just past the midway point between Fort Collins and the Big South Trail where I was snowshoeing in February. As it turned out, even with the six inches of snow we received in Fort Collins, there wasn’t quite enough snow to make it necessary to be wearing Big Foot-sized contraptions on one’s feet necessary. About half of our group did not bother to wear them, including those who were out front blazing the trail for the rest of us. 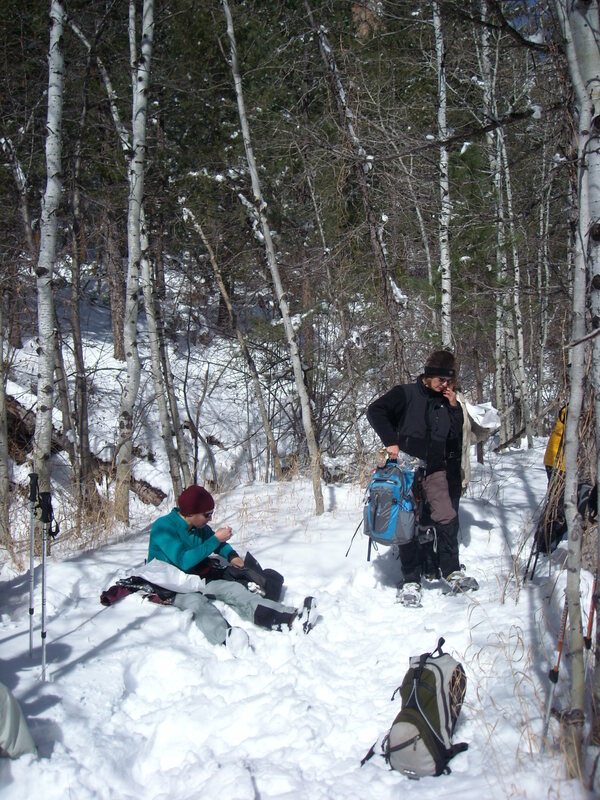 Then there was the poor soul who started the hike wearing snowshoes but they kept falling off. 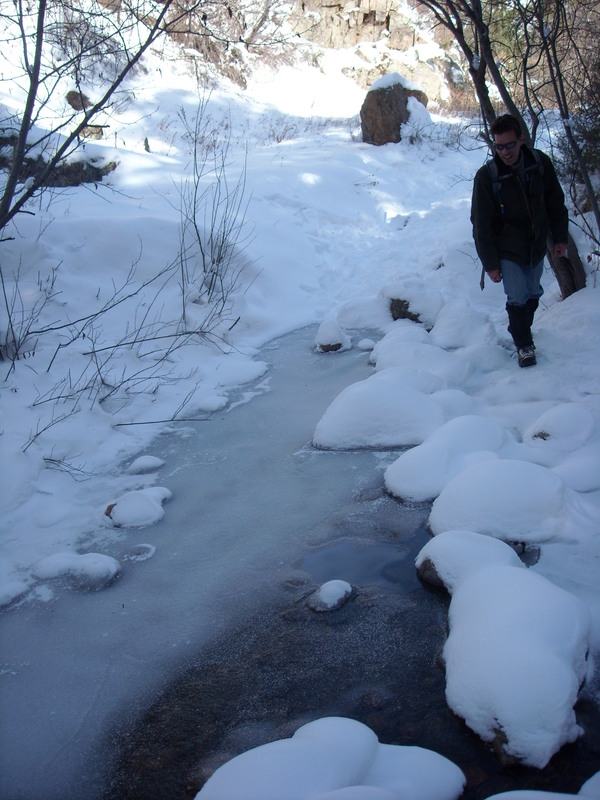 This was just as well, as there were stream crossings every half-mile or so, which were easier to cross without snowshoes. 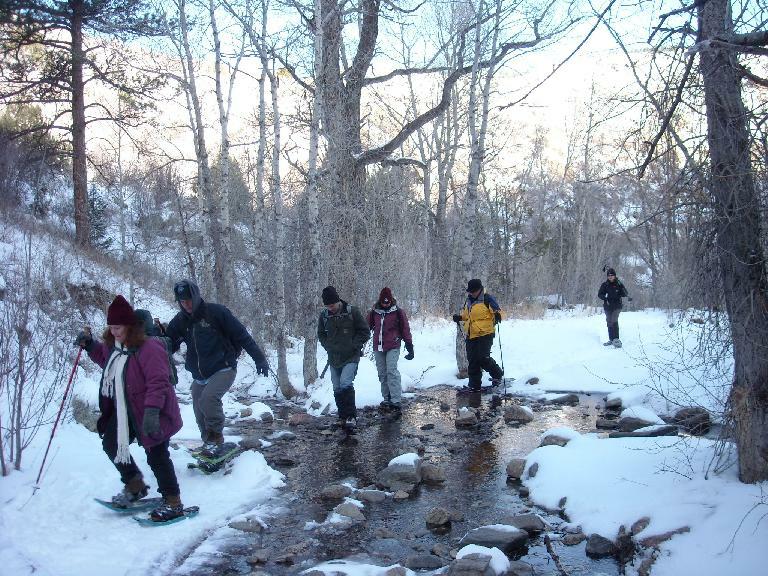 They would have been even easier to cross if someone (ok, me) did not keep breaking through the frozen solid top layers of the streams with the crampons on the bottoms of his snowshoes, effectively ruining any opportunities for anyone in the group to claim they were Jesus Christ by walking on water. Nevertheless, despite the snow being a bit thin and the hike being rather short (about four miles), everyone seemed to have a good time in the company of the rest of the group. I particularly enjoyed meeting Anna, a motorcycle chick who’s been a reader of this website; and Kimberley, whom I talked with on the way back and is seemingly involved with more organizations in Fort Collins than I am! 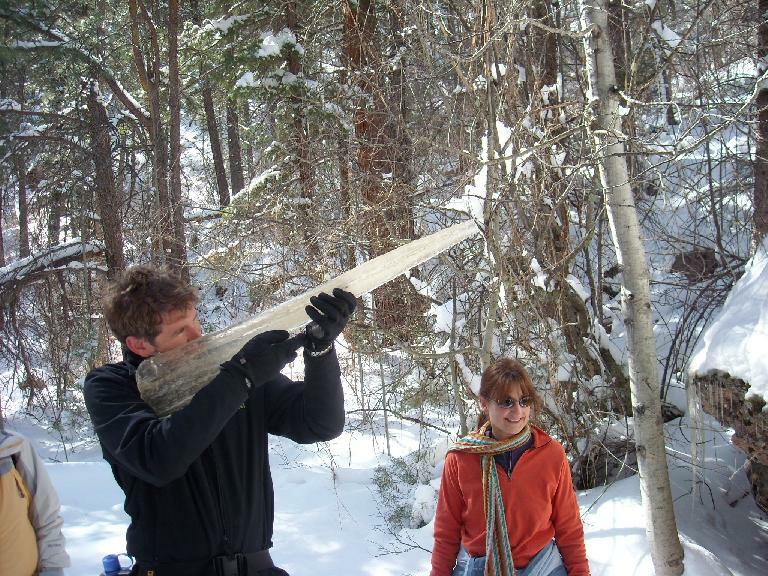 By the time we returned to our cars, the snow was visibly melting in the sun and 45-degree heat, and I returned home convinced that the day’s hike was indeed the last time I’d be able to stomp around in my snowshoes until next year. It’s just as well; the dry last few months had seemed more like spring than winter, and I’m already looking forward to summer. Good hike and nice write up. It was nice to finally meet you.